The Sugababes get the party started! The girls ask the audience to lend a hand. Keisha and Amelle get caught having an Abba moment. The girls encourage the audience for a great big sing song. The girls shimmered in their sparkly dresses. Don't they look great! Keisha takes the lead for this one. The girls get into the groove. Amelle looks surprised to see the packed out arena. Keisha tells it like it is. Sisters are doing it for themselves. The girls have a break for a dance in 'Push the Button'. Amelle and Heidi from the Sugababes united together in perfect harmony. 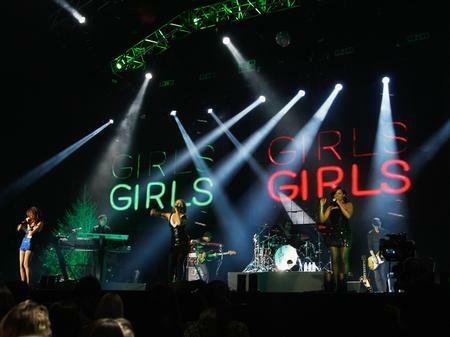 Sugababes gave a great performance, but who were your favourites on the night?